These are my daughters favourite flavour tic tac. Not over sweet and a good size that you can give the little ones 3 or so as a special treat and know they aren’t being overloaded with sugar. I often have the peppermint tic tacs in my bag for a quick breath freshener. These are more of a lolly. Love the little size, love the compact plastic container making it easy to transport. I do like to have Tic Tacs in my bag for after meals and for when I need to freshen by breath. Tic Tacs are good and I prefer the original flavour. Tic tac tropical have a sweet yet rewarding taste compared to the other varieties of tic tacos,it seems to be the one the grandkids select while going through the checkout. Tic Tac tropical is a lovely flavoured Tic TAC that is a nice change from the original which l love, handy to pop in the handbag and enjoy anytime! 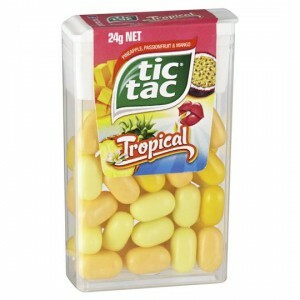 How would you rate Tic Tac Tropical?